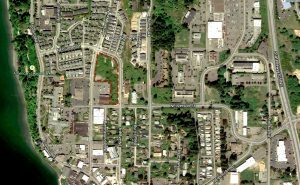 A developer filed a site plan review application for a 107-unit assisted living facility on a 2.2-acre property adjacent to the Jensen Way post office. 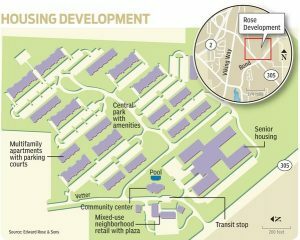 The Poulsbo Place II complex also would include 24 independent living apartments and a 4,250 square feet of retail space. A garage under the building would provide 145 parking spaces. The applicant is David Smith of Central Highland, which developed other portions of the Poulsbo Place master plan area. Rice Fergus Miller is the architect. A public open house for the project was held in March 2015. According to the notice of application, the applicant is requesting several amendments to the master plan to accommodate the assisted living facility. The changes require City Council approval. 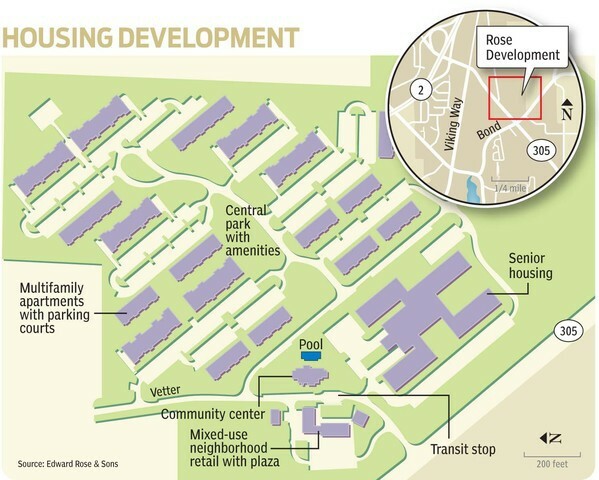 These include increasing height limitations to allow a 45-foot average elevation for portions of the building, and treating assisted living as a “commercial use” to remain consistent with the land use mix outlined in the master plan. Comments on the application will be accepted through June 3. See the full notice below for more details and click here to view a set of drawings filed with the city. A Bainbridge Island nursing home and a waterfront shopping center in Port Orchard were among the top commercial property sales of April. A total of 22 commercial parcels changed hands that month for a combined $8.57 million, according to county assessor’s documents. Sold by: Extendicare Homes Inc. to Bainbridge Health Holdings Inc. Description: A 1.85-acre property and 69-bed nursing home at 835 Madison Ave. in Winslow. Notes: The company that bought the home is The Ensign Group, which operates about 150 health care facilities. Island Health and Rehab will be operated under Pennant, Ensign’s subsidiary in the Northwest. Read an earlier post about the sale here. Sold by: Port Orchard Shopping Center to Eagle 253 LLC. Description: A 1.57 acre waterfront property with a 26,000-square-foot shopping center on the 1200 block of Bay Street. Notes: Eagle 253 is a Bruce Titus company. The property is next door to the Bruce Titus Ford dealership. Tenants at the shopping center include a St. Vincent de Paul thrift store. Sold by: Raab and Raab Properties, LLC. to Car Wash Enterprises, Inc. Description: A three-quarter-acre parcel at the southeast corner of Hostmark Street and Highway 305. A Chevron station and convenience store were recently demolished. Notes: Car Wash Enterprises does business as Brown Bear Car Wash. Brown Bear already operated the gas station and store at the site. 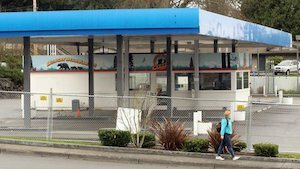 They closed the Poulsbo Chevron, along with one on Bainbridge Island, earlier this year. Redevelopment for the two Highway 305 properties are unclear at this point. Sold by: Gary Parker, as trustee for Vicki Parker, to Knowlton LLC. Description: A little less than an acre and a 10,000-square-foot shop and retail space at 5921 Highway 303. Notes: It appears the owners of LK’s Auto Repair are bought the location where they were doing business. Island Health and Rehabilitation on Bainbridge is under new ownership. The for-profit, 69-bed skilled nursing home was purchased Friday by The Ensign Group, Inc. Ensign bought both the nursing home operation and real estate at 835 Madison Ave. N, according to a news release. The sale hadn’t been recorded with the county as of Monday and a sales price wasn’t available. Ensign owns 150 health care facilities in the western United States, including nine in Washington. The Bainbridge Island nursing home will be operated under Pennant, Ensign’s subsidiary in the Northwest. “This Bainbridge team of caregivers has offered devoted service to patients and family members for many years and we look forward to working together as we strive to deliver top-notch care to this community,” Pennant President Spencer Burton said in the release. Island Health and Rehabilitation was previously owned by Extendicare, which still owns Bremerton Health and Rehabilitation and Forest Ridge Health and Rehabilitation. Island Health and Rehab underwent a recent revamp to improve its quality ratings. The nursing home currently has a five-star “much above average” rating on Medicare’s Nursing Home Compare website. You can find quality ratings and deficiency reports for all Kitsap County nursing homes in the Sun’s nursing home database. A company is seeking tax exempt bonds to help it buy and renovate two senior housing apartment complexes near in Belfair. The properties are the Ashford House and Belfair House on Highway 3. Preservation Portfolio Associates is seeking up to $3.5 million in revenue bonds through the Washington State Housing Finance Commission to offset the $6 million cost of buying and rehabilitating the properties. A hearing on the proposed bond issuance will be held Dec. 18 in Seattle, according to a legal notice. The two apartment complexes total 48 units. A portion of those homes will be set aside as low-income housing, according to the notice. Cascade Living Group is finalizing the purchase of Albright House, a 39-unit assisted living facility in East Bremerton. Cascade founder Tom Stanley said the $3.3 million deal will close Monday night. Albright House was operated by Assisted Living Concepts, a national company now apparently called Enlivant. Bothell-based Cascade already owns two properties neighboring Albright off Pine Road: The Willows, an independent living community; and Ashley Gardens, a memory care community. Ashley Gardens of Bremerton was the first facility purchased by Cascade after the company formed in 2006. With the addition of The Cottage, Cascade will operate 11 communities in three states. Emeritus Corp., which operates senior living communities in Poulsbo and Gig Harbor, has agreed to a purchase by Tennessee-based Brookdale Senior Living. The acquisition was announced in a news release Thursday. The transaction value totals $2.8 billion, including $1.4 billion in Emeritus’ mortgage debt. According to the release, the acquisition will create a nationwide senior living network with more than 1,100 facilities in 46 states. The merger of the two companies will likely take place in late 2014. We’ll check on what the implications of the purchase for local Emeritus clients could be. The Tacoma News Tribune has more details on the acquisition.